Quality ProductsAS SOFT AS A BABY’S BUM! 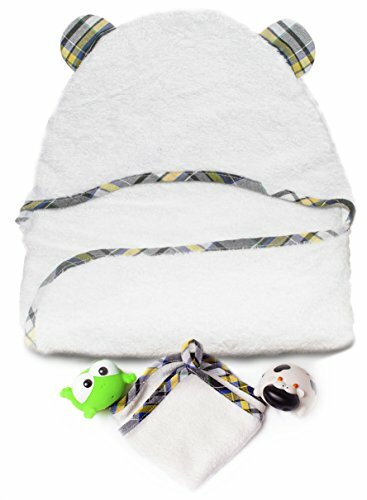 Plushy Baby uses superior 100% organic bamboo to create the most comfortable and durable baby hooded towel. 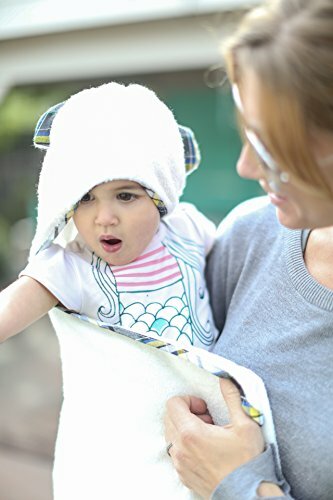 Rest assured we use the highest quality bamboo to provide the ultimate softness and comfort to keep your baby warm after each bath time, at the beach or poolside. Our premium bamboo is ideal for babies with sensitive skin or skin conditions like eczema, acne, and allergies, etc. Our bamboo is hypoallergenic, antibacterial, mold, & odor resistant. IMPRESSIVE PACKAGING WITH FREE BONUS’MAKING THE ULTIMATE SET! Need a baby shower gift or newborn gift? We got you covered!! 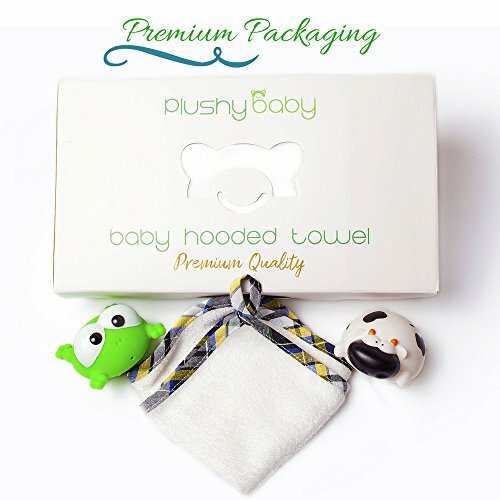 We missed no details with our custom created packaging to adding a matching washcloth and 2 cute squeezable bath toys for a complete bathroom kit for new parents and babies. This makes the perfect unisex baby shower gift, birthday or baby registry gift! This gift makes a complete bathing experience while being eco-friendly and great for the babies health. SUPER THICK& ABSORBENT! 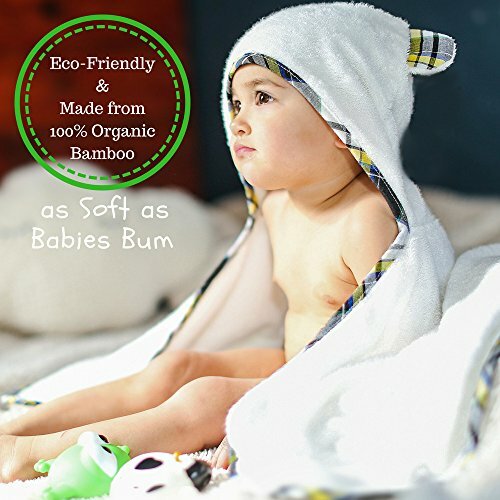 Plush Baby’s premium towels are 500 GSM (grams per square meter) meaning that our bamboo towels absorb 60% more than the typical cotton towels and dry faster for its next use. 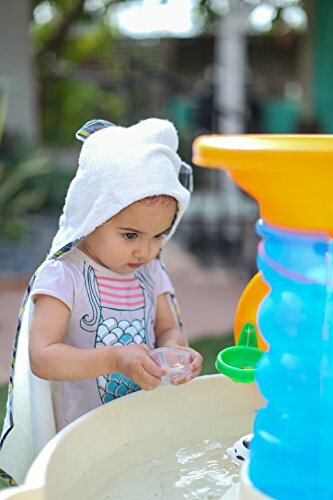 This will dry your baby quicker and absorb the water leaving your baby happy and content in their adorable towel after bath time, at the pool or the beach. 100% GUARANTEED! 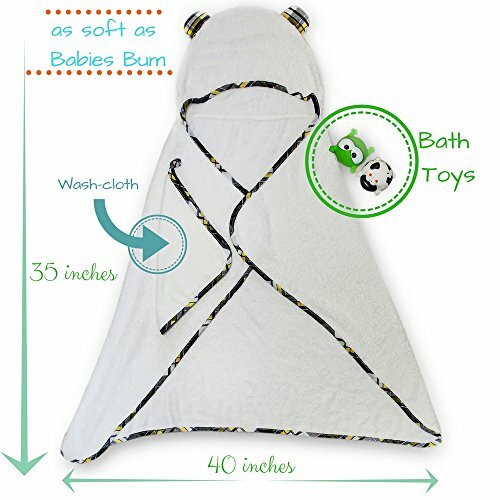 We know you will love our Plushy Baby Hooded Towels as much as we do but in the case, it does not meet your satisfaction we guarantee 100% satisfaction no questions asked.